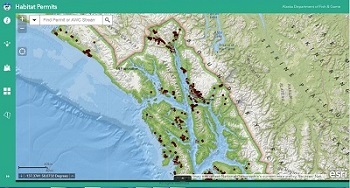 The ADF&G Divisions of Habitat (Southeast Region) and Sport Fish (Research & Technical Services) are testing an application that allows desktop and mobile users to view habitat permits and staff reports by location. After entering the application and agreeing with the terms and conditions, click the info button at the top left and select map help for instructions. The application currently contains permit data from 2008-present. NOTE: the data set for this application includes permits issued by the Douglas office only and is updated quarterly. Statewide permit data is not currently displayed in this application. The Division of Habitat is currently working to expand this application to include data for the entire state and provide real-time access to information on habitat permits issued. We anticipate having a limited data set available by the end of 2018 and will udpate this timeline as the project proceeds. Please contact us at dfg.hab.publicinfo@alaska.gov with any questions or for more information on this effort.